Ownership / Access: Now the Museo Nazionale d'Abruzzo. Notes: Forte Spagnolo, L'Aquila (Italian for Spanish fortress; locally called il Castello) is a Renaissance castle in L'Aquila, central Italy.In the 15th century, L'Aquila had become the second most powerful city in the Kingdom of Naples after Naples itself: there were half a million sheep, wool and saffron were exported throughout Europe; all this was lost when the Aquilans, during the war between the French and the Spaniards for the throne of Naples, sided with the French. In 1504 Aquila was occupied by the Spanish conquerors, though in 1527 the French recovered the city with the support of the citizens and the surrounding town. One year later Viceroy Philibert of Orange, ruling for King Charles V of Spain, finally defeated the Aquilan rebels and ordered the city to build a fortress in the highest spot North of the city, exactly where in 1401 King Ladislaus had built a garrison to control the unruly and rebellious Aquilans. The project was entrusted to a Spanish architect, Pedro Luis Escrivà, an expert of firearms, who had begun to build Castel Sant'Elmo in Naples. The discovery of gunpowder obliged to new methods of defensive construction. Escrivà was in charge of the project for 2 years, leaving the task to Gian Girolamo Escribà. 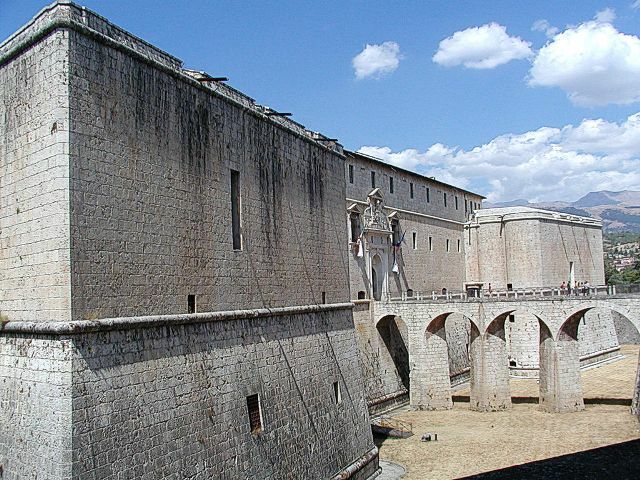 In the following 30 years the heavy taxes necessary to build the fortress impoverished the city, which in 1567 begged the Spaniards to stop the construction; the Royal Court granted the request, and works were interrupted, so parts of the castle were never completed. The fortress had cost an enormous sum for the times, and Aquila was obliged also to sell the thick silver case containing the body of St. Bernardino of Siena. The fortress, which had been built not to defend the city, but to control it (its cannons pointed to the city) and to be a completely self-sufficient structure, was never used in a battle.